If a mother’s love can’t be measured in time, wealth, or happiness, then what does it mean to be a good mother? Imago Theatre’s production of Other People’s Children is a fine balance of intimate trust between three adults who share the responsibility of raising a child. 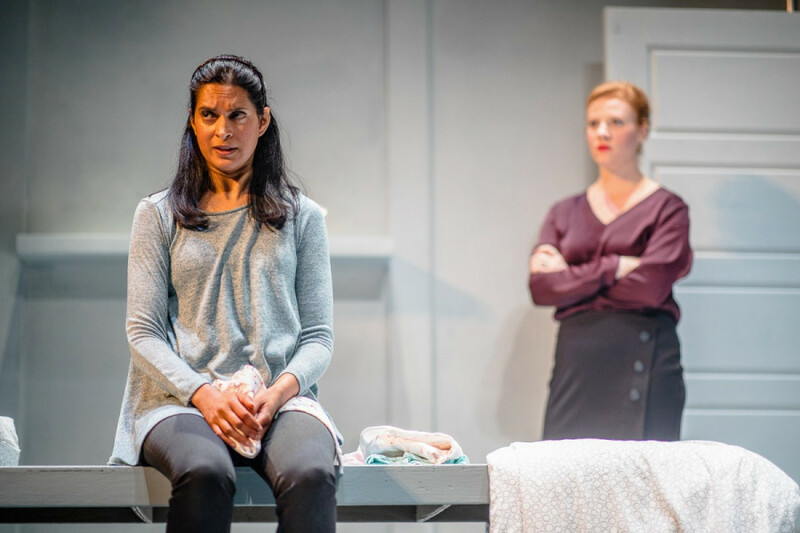 This chilling play features a new mother, Ilana, in the grips of postpartum depression, who struggles to care for herself and her baby in the early months of parenthood. Ilana faces constant criticism from her husband, Ben, who insists that she needs to bond with her child. The young Canadian couple embrace each other in love and rage throughout the show as they force their expectations of parenthood onto the other. Each combat leaves them more discouraged about their ability to raise a family. Ilana, played by Kathleen Stavert, craves her former life as a working professional, and insists on finding a full-time nanny to relieve her of her household duties. She contacts a migrant care agency and employs a young Sri Lankan nanny named Sati to live and work in their household. The entire show takes place in the two most intimate corners of the young couple’s home: the master bathroom and Sati’s bedroom. Both stages are mostly bare, but the chemistry of the actors onstage fills each room. The dialogue is fast paced and powerful, scripted by the sensational Canadian playwright Hannah Moscovitch. Moscovitch’s expert script dives directly into the most private details of parenthood. The language is brash; it engages the most gruesome details of child care, and embraces the body of a mother and all of its explicit functions. The candid language reflects on the shame surrounding postpartum depression. It’s clear that Ilana is suffering, but she will not address her illness. Her husband lacks trust in her abilities as a parent, and his confidence and attention is averted to young Sati, who connects easily with their infant child, Eva. In the play, Sati is a blank canvas who does not express her opinion or any contradictory thought. Actor Asha Vijayasingham brings this character to life, brilliantly demonstrating the struggle of immigration. As she works as a nanny for the young family, she is in pursuit of a better life for her own. After two years of caregiving in one household, Sati will have the opportunity to gain Canadian citizenship and bring her children to Canada to live with her. Through her work, Sati grows attached to Ben and the child in ways that push the boundary of professionalism. The maternal differences between the two women keep the couple constantly wondering if the arrangement is working, and if they are good parents after all. Ilana and Ben have an intense chemistry that charges the space onstage. The hostile love between them creates an epic emotion that captures the audience. Their relationship is profoundly physical; the young lovers touch and seize each other for attention. Most of their disputes occur in the master bathroom⎼a room that immediately holds tension and vulnerability once in focus. The transitions between scenes are filled with erie music, so the audience is always on edge when confrontation arises. Ben and Ilana both have fiery personalities that could spark at any moment. The play is packed with maximum energy for 75 straight minutes; there are no intermission, and consequently no break from the reality of parenthood for the audience. Whether or not viewers have experience in childcare, it makes no difference. This show is about relationships; if you’ve ever loved, trusted, or enraged someone in your private home you will connect with the raw underside of Other People’s Children. From Oct. 25 until Nov. 4 this uneasy family is calling the Centaur Theatre home. Advanced tickets are $20 for students and $25 general admission, or on the day of the show you can pay what you can at the door.